Industrial manufacturing faces multiple challenges, from labor shortages to ever increasing efficiency demands and the maintenance of high levels of efficiency over time. 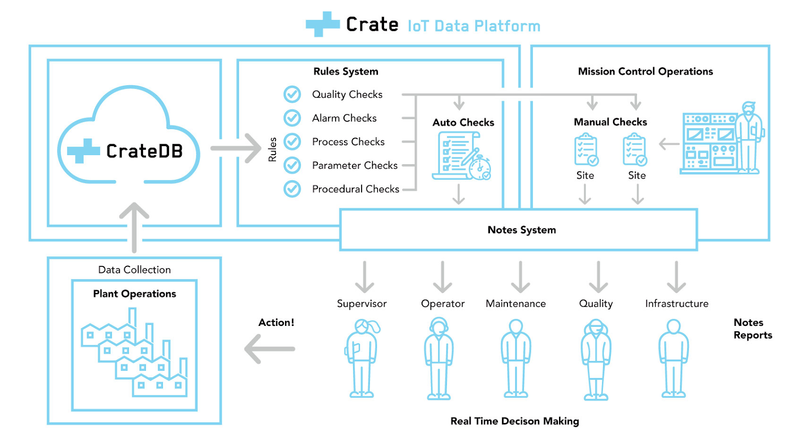 In this post, I will show you how ALPLA — a world leader in the development and production of plastic packaging solutions — is using the Crate IoT Data Platform to harness the power of machine data to address these challenges. ALPLA is well known in the consumer packaged goods market for its innovative packaging systems, bottles, closures, and injection-molded parts. Founded in 1955 and based in Austria, the company serves major brands in markets such as beverages, food, beauty care, and home care. Innovative manufacturing secures global leadership for ALPLA because they achieve best-in-class quality at high volume at a competitive price. This is where real-time information from the production floor has the potential to add value to 178 manufacturing sites in 46 countries. In 2017 alone, ALPLA produced over 100 billion consumer goods packages. And with over 100,000 tons of recycled plastic, it is also one of the leading packaging companies when it comes to minimizing plastic waste and plastic reuse, also known as the closed-loop plastic economy. The raw plastic is pulled from big silos in the form of pellets. The pellets are transported to the material dosing equipment. There, coloring materials and other additives can be mixed in. In the processing machine, pellets are melted and extruded into a metal mold. The mold is cooled so that the plastic freezes on contact, forming a bottle. The bottles are weighed on a scale and inspected for leaks in a testing machine by filling it with pressurized air and testing for pressure decline. A visual inspection is done using camera systems to detect defects and check the dimensions of the bottles. Bottles are then moved to the handling machines, where they are boxed, packaged, palletized, and taken to the warehouse for delivery to the customer. Temperatures, pressures, blending ratios, and other settings need to be precise on every machine. When these settings are right, high-quality products are the result. When these settings are off, quality suffers, and production costs increase. In the past, discovering issues required multiple people to be continually moving around the factory checking up on every machine. As production lines are laid out over the whole factory, distances between machines can be considerable, meaning this was a slow and labor-intensive operation. Additionally, the latency introduced by having to walk around the factory meant that many products were often affected by a defect before the error was even spotted by an operator. This resulted in the loss of valuable machine time—and a loss of raw material. ALPLA's market entry in North America in 2001 was followed by years of tremendous growth. In 2015 it was already operating 14 manufacturing plants with more than 1,000 employees in the USA. This growth came with the challenge of hiring and training enough personnel to run the complex manufacturing processes. And because modern manufacturing machines each have a different sort of complex user interface, every plant required specially trained experts for every machine on every shift. Despite the difficulties with the original manufacturing process, ALPLA was producing plenty of data. Around 3 GB per day. All coming from the process control systems and sensors. But there was no system to coordinate this information in a useful way. 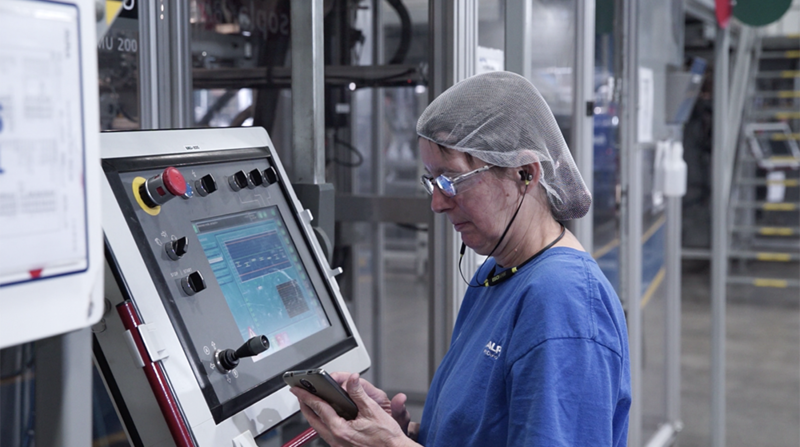 Jodok Schäffler, then General Manager of ALPLA North America, wanted to find a way to speed up the employee training process and operate the production line with more efficiency and less latency. However, the traditional ways of building up experience through classroom training and with Lean, Six Sigma, TPM, and so on, were taking too long. At a conference in 2016 on The Future of Manufacturing at the Georgia Institute of Technology in Atlanta, Jodok saw a presentation on Data-Driven Performance Improvement that demonstrated ways to use visualization and rule-systems to monitor processes in real-time, delivering actionable guidance to operators allowing them to address issues as and when they occur. He saw the direction the manufacturing industry was moving and wanted to move in that direction too. Fast. Jodok challenged the IT department to find a workable system. The result of this search was a proof of concept, built by Crate.io. Using the Crate IoT Machine Data Platform, they presented a solution that works for huge amounts of real-time data in a multi-plant environment. Other options were considered, but they were too complicated or were proprietary closed-source systems that came at 10x the cost. ALPLA already had a proprietary in-house system that was collecting machine data using an SQL database as a data warehouse. All plants in the USA were connected to this system, and the data volume was growing with every additional plant. As a result of rapid growth, database performance degraded. Response time for queries got longer, and any analytics work on the data was taking more and more time. Real-time, actionable guidance on the production floor was not possible. Crate.io built their proof of concept for database performance in one week. The first step was to send data to CrateDB alongside the existing SQL database. Performance of the system improved immediately. Reports and analytics could be generated in seconds instead of minutes, and the system became capable of giving real-time guidance for workers on the production floor. The desired production state can be defined using sources of information such as product specifications, Bills of Materials from the Enterprise Resource Planning (ERP) system, product specifications and tolerances from Quality Assurance (QA) systems, target times from shop floor planning system, and so on. This desired state can then be compared to the actual state of the production line, as represented by the machine data being collected. 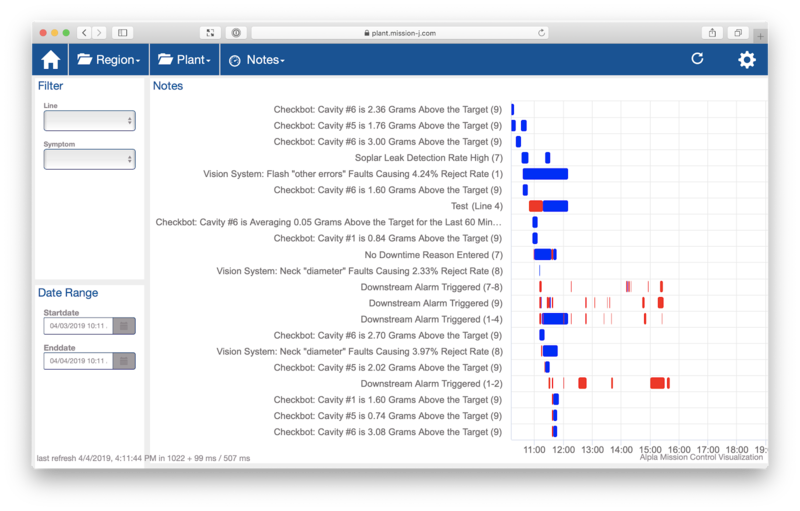 Analytics, monitoring, and visualization dashboards can be built on top of the Crate IoT Data Platform. 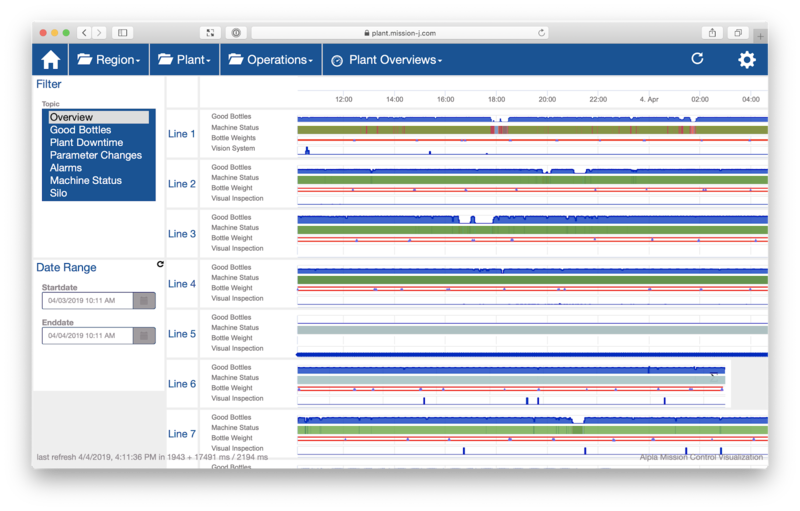 This allows supervisors and management to get immediate insights into any aspect of the production process at a glance. Deviations between the desired state and the actual state of the production line indicate a need for action on the shop floor. To that end, a rules system runs predefined checks on all of the data streaming into CrateDB from all of the connected plants. Failing checks are then converted into notes (i.e., individual pieces of actionable feedback) that are sent to staff on the shop floor. Let's take a closer look at how that works. Quality checksChecks that monitor product quality, e.g., weight data from a scale, dimensional deviations from a vision system and so on. Alarm checksChecks that monitor alarm messages from the production machines, such as material running low in a piece of dosing equipment or a transport conveyor being blocked. Process checksChecks that monitor the state of a process, e.g., the temperature of molten plastic in an extruder or the pressure at the extrusion nozzle. Parameter checksChecks that monitor the configured parameters of a machine, such as the speed setting of an extruder. Procedural checksChecks that are based on procedural requirements, e.g., a periodic need to clean certain parts of a machine.Maintenance schedules can take into account the production run time of a machine instead of being done on a predefined schedule. This reduces the burden of maintenance work. Checks that are defined for a specific production process in one plant can be reused in other plants with the same production process, making the system easily scalable and reducing the cost of duplicate work. Some sorts of checks are automatically converted into notes and sent to the production floor immediately. Other checks are sent to Mission Control so that a process expert can assess and validated them before creating a note for the production floor. 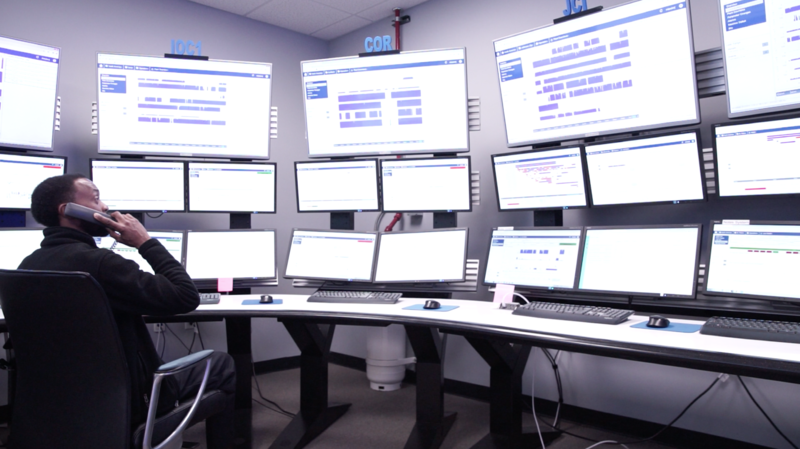 With the Crate IoT Data Platform system place, ALPLA were able to set up a dedicated Mission Control room in McDonough, GA where operators are able to monitor and support the operation of 11 plants across the USA. Having a single Mission Control room allows ALPLA to consolidate training and expertise in one location. Manual checks that are triggered by the rules system are brought to the Mission Control operator's attention. The Mission Control dashboards provide insight into the current state of the machines and processes as well as related historical data (from the previous minutes to the last couple of months). From this high-level vantage point, operators can put those manual checks into context and notify staff on the shop floor by issuing manual notes if necessary. For example, if an electric drive temperature manual check was triggered, the Mission Control operator can see whether the temperature suddenly spiked or was slowly rising. After checking on the overall throughput and ambient temperature, the Mission Control operator might send a note to the machine operator asking them to check the drive cooling. This pre-emptive action helps to avoid unexpected drive shutdown, reducing downtime and increasing OEE. As another example, the Mission Control operator might see an upward trend in the weight of a product. By sending a note to the machine operator, this weight drift can be corrected before it becomes a quality control issue. This, in turn, reduces material waste caused by out-of-spec products. Automatic checks and the Mission Control operators are responsible for initiating notes that are sent to the shop floor. These notes are received by assignees responsible for specific tasks, such as machine operation or maintenance. Assignees are equipped with Bluetooth earbuds. Each note results in a voice notification using text-to-speech functionality, and the assignee can accept the note by pressing a button on the earbuds. A list of notes, resembling an automatically maintained to-do list for this assignee. After selecting a note, the operator has immediate access to detailed information and proposed resolution activities. Notes can attach documents with instructions on how to perform the proposed resolution activities. This brings relevant training documentation directly to the person who needs it, helping with employee onboarding. The application can also provide real-time reporting directly to the assignee. For example, a report showing the remaining production time for the current production lots on all lines. This allows the assignee to start preparing for a line change ahead of time. Machine manuals, operating instructions, and other documentation are available directly within the application. This gives an operator immediate access to essential documents on the production floor. Custom notes can be created directly on the mobile device and photos can be attached. This allows, for example, a supervisor to document a repair request when and where it occurs and bring it to the attention of maintenance. You can also schedule tasks to trigger at a later point in time. After resolving the issue, the notes assignee selects the proposed resolution activities which led to a resolution. This information is stored with the note and can be used for ongoing process analysis and improvement. When a note is marked as resolved, the rules system re-runs the original check that initially triggered the note. This is used to verify that the steps taken have actually resolved the issue. 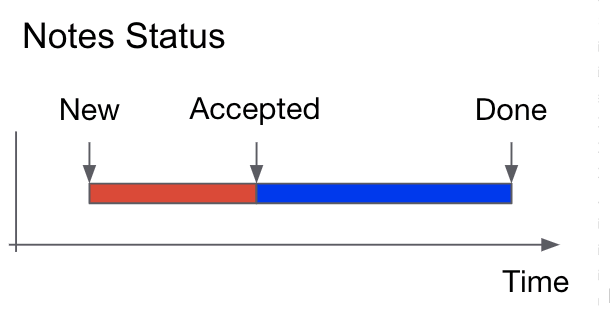 Here, the red bar shows how much time it took for the assignee to accept the note and the blue bar shows how much time it took to resolve the issue. Historical information about issues (especially tricky or persistent issues) is reviewed during regular production meetings and is ultimately used as input for maintenance planning and Continuous Improvement Programs (CIP). After a successful CrateDB proof-of-concept, the system that Crate.io built was put into production for 11 ALPLA plants across North America. Every plant using the Crate IoT Data Platform saw improvements in Net Equipment Efficiency (NEE) with some having efficiencies above 90%. Every plant also saw a reduction in manual process adjustments, by as much as 50%. Reducing the number of manual adjustments stabilizes the process and significantly improves production efficiency. The result was a six-figure saving in 2018. And work hasn't even finished yet. Infrastructure equipment (such as chillers, compressors, cooling water systems, power supplies) and downstream equipment (such as conveyors and packaging machines) will be added to the Crate IoT Data Platform in 2019, and further increased savings are anticipated. 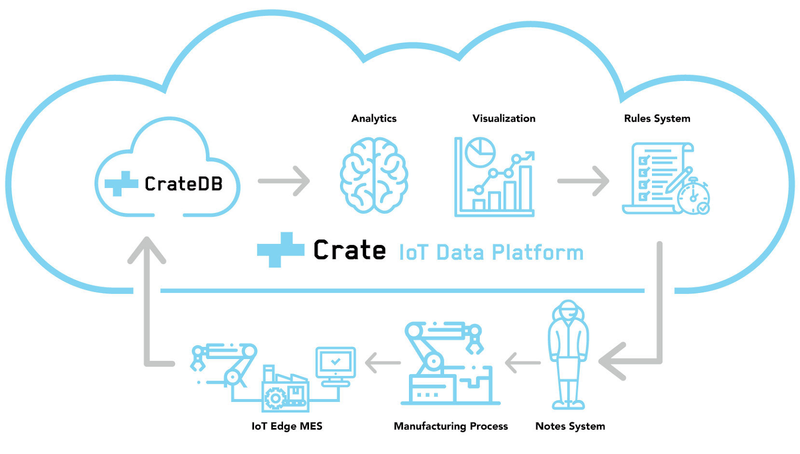 If you're like to know more about the Crate IoT Data Platform or what Crate.io can do for your business, please get in touch.